A growing body of evidence suggests paramedics skip the traditional aspirin tablet and start giving Vitamin-C pills to those who survive a sudden cardiac arrest. Post-cardiac arrest syndrome involves brain damage, heart failure and death, all induced by massive overwhelming oxygen free radicals generated from unpaired electrons. When circulation to the heart is blocked in any of the four coronary arteries that supply the heart with oxygenated blood, the damage to heart muscle occurs when circulation is restored. As oxygen-rich blood floods heart muscle tissue, it is unopposed by endogenous antioxidants (catalase, SOD’ and glutathione) and by dietary antioxidants, particularly Vitamin C. The less antioxidant protection the greater the damage to heart muscle tissue. Heart muscle dies and become fibrotic (scarring). The obvious answer would be to flood the heart muscle with electrons. Vitamin C being the great electron donor of the human body, researchers hypothesize C should be infused intravenously as soon as possible after a heart attack. Heart attacks deplete Vitamin-C stores from cardiac tissues. On the first day after a cardiac arrest, Vitamin-C blood plasma concentrations are reduced by 50% and by another 50% within a period of three days. Oral-dose Vitamin C can approximate blood levels achieved by intravenous delivery. [Journal Orthomolecular Medicine, Volume 20, No. 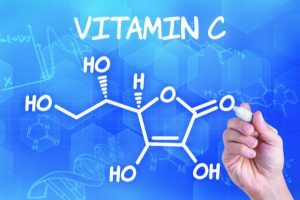 4, 2005] Researchers Steve Hickey, PhD, and Hilary Roberts, PhD, claim oral Vitamin C is potentially more effective than intravenous therapy. A 20,000-milligram dose of oral Vitamin C given in divided doses (4000-5000 mg every 4 hours) to achieve blood levels of 250 micromole/liter blood sample. [Journal Orthomolecular Medicine, Volume 32, No. 2, 2017] Such a high dose is not needed by healthy individuals. A 500 mg oral dose of ascorbic acid (Vitamin C) taken every 4-6 hours achieves optimal blood levels for healthy individuals. By the way, aspirin breaks up blood clots that obstruct blood circulation to heart muscle tissue. Aspirin does not protect heart muscle, Vitamin C does. Aspirin + Vitamin-C tablets are available but the dose of Vitamin C is too low.